The locavore movement of the early 21st century has ties to regional chauvinism, as this document demonstrates. To be a locavore is to postulate that it is best (in terms of energy consumption, sustainable business practices, natural vitamins and minerals, and plain tastiness) to eat what can be locally grown and raised. To be a regional food chauvinist is to assert that food that is locally grown and raised is the just, well, the best, and it’s the tastiest. I’ll not wax any more philosophical about the issue than this. Here is an example of a concerted effort to eat locally, in the eastern Oregon metropolis of Bend in 1929. Bend boomed just before World War I, when new railroad lines and new sawmills brought new residents to a part of the Oregon high desert that had long been isolated and unpopulated. The town’s population in 1910, a year before the railroads arrived, was 536; in 1930, the figure stood at 8,848. And here in the prosperous 1920s we find the Oregon Products Banquet. 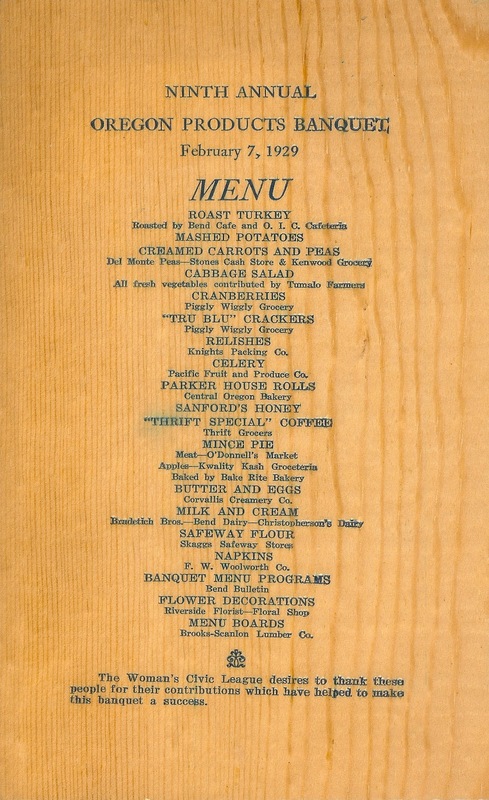 The menu reflects the fact that the landscape around Bend was high desert with pine forest, and that the banquet took place in February (average low daily temperature: 24.7 F). While irrigation had recently brought some agriculture to Deschutes County–potatoes did well–most of the food at the banquet came from someplace else. The fresh vegetables for the cabbage salad were grown in nearby Tumalo, but the peas in the creamed peas and carrots were canned by Del Monte, most likely in California. The butter and eggs came from west of the Cascades, and the origin of much else on the menu is undiscoverable–the food came from local markets, but its provenance is unknown. For sure the menu board itself is local yellow pine, whittled out in Bend by the Brooks-Scanlon Lumber Company!